Britain's Crown Agents' Office is a unique development agency. Until the early 1960s, its clients were colonial governments, and, thereafter, the administrations of dependencies and newly independent countries. As well as purchasing a large proportion of its customers' imports, it provided them with finance and managed their investments. It was thus one of the largest buyers of goods in the UK, and, after, the Bank of England, the country's biggest financial institution. This book, the sequel to the author's Managing the British Empire: The Crown Agents, 1833 -1914 (Boydell, 2004), examines the Agents' various development roles, including the disastrous venture into secondary banking in 1967 which collapsed in 1974, then the largest bankruptcy in British financial history. 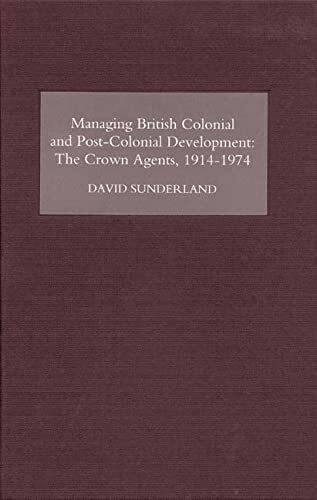 The book contributes to a number of current debates in development studies, adds to our understanding of the London financial market and the competitiveness of British industry, and shows how present day aid agencies can learn much from the arrangements of the past.